A responsive website has the ability to adjust to fit any screen a visitor is using, whether it’s a phone, tablet or desktop computer. It’s not static, not locked into one format. Responsive website design makes it possible for the site to seamlessly reposition and realign its content, images and structure from one device to the next. The user experience doesn’t change from one to another, even though the “look” of the site might vary somewhat. Responsive web design (RWD) is essential to successful site reading and navigation. By providing equal access to information no matter which device a user has at hand, RWD guarantees quick and easy browsing, providing a gateway to a positive user experience. Smooth and effective usability also increases the likelihood that a website visitor won’t be quick to click elsewhere. In addition to fostering a productive user experience, responsive web design factors into Google rankings; their algorithms quantify “time on page,” and longer stays can translate into higher placement in a search. So what’s good for your user, in terms of an easy-to-navigate website, is also good for your business, in terms of all-important search engine optimization (SEO). Mobile phones are becoming the most prevalent way people access the internet, making this a priority in responsive web design. Users always like easy browsing when they’re online, and if your site doesn’t adapt to mobile formats, visitors might have a challenging time reading your content and navigating from page to page. Problems like these can negatively impact engagement. On the other hand, a responsive site invites user involvement. This is reflected in a longer stay, a better user experience, and higher SEO rankings, which track (among other things) how long individuals stay on a particular website. Who hasn’t clicked away from a website because it was taking too long for the page to load? You don’t want this happening on your site, One of the key benefits of RWD is faster page loading time across all formats. Quick page loading is a win-win for both your business and your website visitors. People will be more inclined to stay on your site if pages load right away. Also, this is another factor that’s tracked by SEO algorithms, and fast-loading websites are rewarded by Google with higher rankings. Faster page loading speeds and other positive results of responsive web design enhance the user experience in a number of ways. One notable benefit is increased conversions, which means that a visitor to your website does more than just check out your content; he or she becomes into a participant. This happens when someone subscribes to a newsletter, donates money to a non-profit, makes a purchase or otherwise engages with your company through the website and shares their contact information. By doing this, they’re inevitably spending more time on the site, a trait favorably recognized in SEO tracking. A bounce rate tracks the percentage of users who leave your site after looking at just one page. A high bounce rate is bad, and it’s reflected in SEO rankings. But the easily managed content provided by responsive web design creates a site experience that’s more attractive and inviting to users, resulting in their staying longer on each page and on the site itself, which reduces the bounce rate. The longer your easy-to-use website design gets them to stay, the more likely they are to directly interact with your organization. The fact that a lower bounce rate can result in a higher Google ranking is a terrific bonus. Duplicate content is a website issue that occurs when sizable blocks of content that are identical or nearly so, appear on more than one website or on more than one page of a single site. When this is spotted by a search engine, it can harm a site’s rankings; if more than one specific URL has the same content, only one will be chosen for the best SEO ranking. Most sites don’t intentionally create duplicate content; nevertheless, according to a 2015 study by Raven, an internet marketing company, nearly 30 percent of the information on the internet is duplicate content. If you have one version of your site for desktop use and an entirely separate one for smartphones, the repetition of your singular content in both places could get flagged by a search engine as duplicate content. 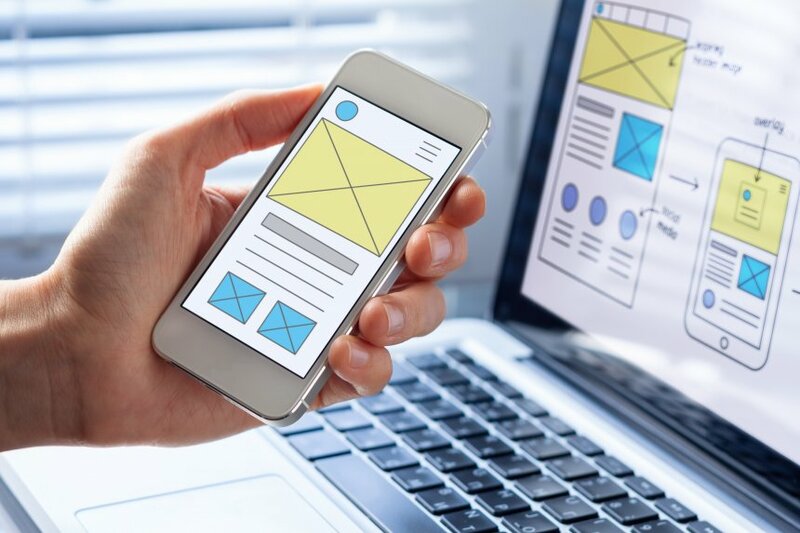 Responsive web design takes care of this problem, because it utilizes only one version of your website tailored for use across different devices. Responsive web design is an excellent tool to improve your site’s marketing efforts. By making your site easy to read and navigate across all devices, users won’t be distracted and can focus on what your company is about and be more receptive to your content and message. Additionally, responsive web design requires much less maintenance than earlier formulations. There’s no need to go back and forth between managing desktop and mobile versions of your website; with RWD you make edits and updates only once. Whatever changes you make on one version are automatically reflected on the other, adjusted and formatted to fit each screen. That’s good news for users of the site – and your tech team, too! If you’re still feeling like a web design rookie, feel free to check out The Beginner’s Guide to Web Design. This guide packs tons of great information into a straightforward, easy to consume format that can help you elevate your web design knowledge. And if you want to take it a step further, get in touch with us about how we can help grow your digital presence.